Last week a reader and fellow cupcake enthusiast, Keely, contacted us after purchasing a Pumpkin cupcake from the Barnes & Noble Starbucks, in Baltimore’s Inner Harbor. The cupcakes at this location are provided by The Cheesecake Factory. Keely said we could share her review on our blog, and we are happy to do so! 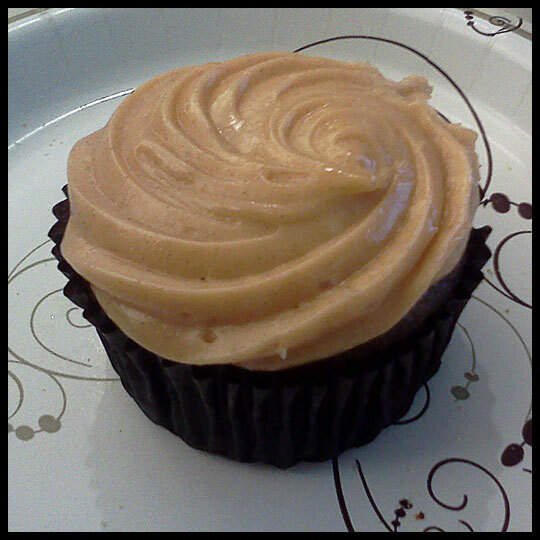 We LOVE all things pumpkin and are looking forward to reviewing many more fall related cupcakes. Keely runs her own blog, Between a Breath and a Blink, and has challenged herself with tasting anything and everything she encounters in Baltimore City that is pumpkin flavored and this cupcake was the first item she conquered. Thanks for sharing your review with us, Keely! We looking forward to following (and joining) you on your pumpkin adventure. This entry was posted in Baltimore, Cupcakes and tagged Barnes & Noble, Cheesecake Factory, Cheesecake Factory Starbucks Barnes & Noble, pumpkin cupcake, Starbucks by Stacy. Bookmark the permalink. What a great idea, trying all things “pumpkin” in Baltimore! I recently had a Pumpkin Spiced latte from 7-11 and was pretty impressed! Really? I almost stopped by 7-11 for a coffee the other day, I’ll have to see if they have that! I love trying all things holiday flavored because they’re only here for such a short time. I’m with you Tiffany! I’m obsessed with seasonal flavors!